Take the normal approach, and your current chances of being funded by an investor, private equity or venture capitalist equates to roughly 1%. Understand the process and put yourself in the investor’s shoes, and you may substantially increase these odds so that you and your business may survive the investor’s selection process and secure that needed investment partner. Appreciating what an investor does and how he screens, filters and selects investment opportunities will allow you to understand what professional investors do, how they do it, what type of information they will seek from you, and that will make the difference between leaving with, or without, a check. 1. Raise Funds An investor raises funds from sources like pension and retirement funds, endowments, insurance companies, and high-net-worth individuals (HNWIs). 2. Source Deals Investors identify and find deals, carry out due diligence (research and analysis on identified deals), and close transactions (negotiate and buy) to purchase shareholdings in companies the investor likes. 3. 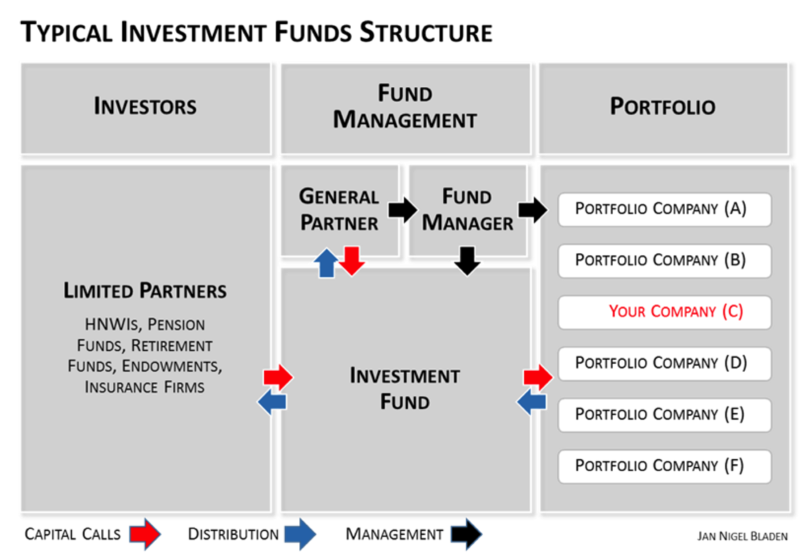 Manage Portfolio Investors help improve operations, manage costs, drive performance and tighten management in their portfolio of acquired companies, with the sole objective of improving the value of these companies. 4. Exit Investors now sell their shareholdings in an improved portfolio company (i.e. they exit the investment) at a profit. The principal investor, or General Partner as they are known in the private equity industry, raise capital by approaching external third parties, or Limited Partners, for capital commitments. The General Partners may also contribute some of their own capital to the Investment Fund from which funding will be made available to invest in your business, if you are selected as one of the Investment Fund’s portfolio companies. Your investor (the General Partner or the Fund Manager) will tend to prefer a small number of external or Limited Partners, each contributing a significant amount to the Fund. This normally limits the amount of time, and facilitates the task of the General Partner, when having to manage and report back to his pool of investors and Limited Partners. Ideally, the Fund would have a minority of Limited Partners, each contributing tens to hundreds of millions of dollars, depending on the size and strategy of the Investment Fund. To make things a little bit more complex, many Investment Funds also refer to “first close” and “last close.” First close means when a certain amount of funding has been committed, the Investment Fund can begin to make investments in Portfolio Companies, while new Limited Partners may still join by committing capital for a limited time. Final close means when a second threshold has been reached for committed capital, new Limited Partners may no longer join the Investment Fund. Limited Partners who have expressed a willingness to commit to an investment fund prior to the first close will often enjoy more favorable terms such as reduced management fees and coinvestment rights. Image credit: Jan Nigel Bladen. Question: would you, the reader, invest in a company that only sold one out of every 100 leads? Or, likewise, would you invest in an organization that requires three full-time investment team members to close one transaction in one year? These statistics are, unfortunately, a true reflection of the private equity industry (see data from Teten Advisors, Winter 2010 issue of The Journal of Private Equity), and they demonstrate that deal sourcing is highly inefficient and labor intensive, despite the fact that deal origination (finding deals) is fundamental to a successful investment fund. (Note: Private Equity funds that employ a proactive and creative origination strategy have consistently higher returns, driven by a greater volume and quality of incoming investment opportunities, but that’s for another article.) On the flip side, it does mean that your average successful investor is an expert at sifting through a large truckload of pebbles to find a couple of rough diamonds- find that needle in a haystack. When an investor carries out due diligence of companies for potential acquisition, they will consider elements such as the company’s product or service, the company’s strategic fit within the investor’s portfolio, the company’s strategy, business model, the senior management team and their experience, the industry, the company’s financial performance, risk factors, a valuation and likely exit options and scenarios for the company. 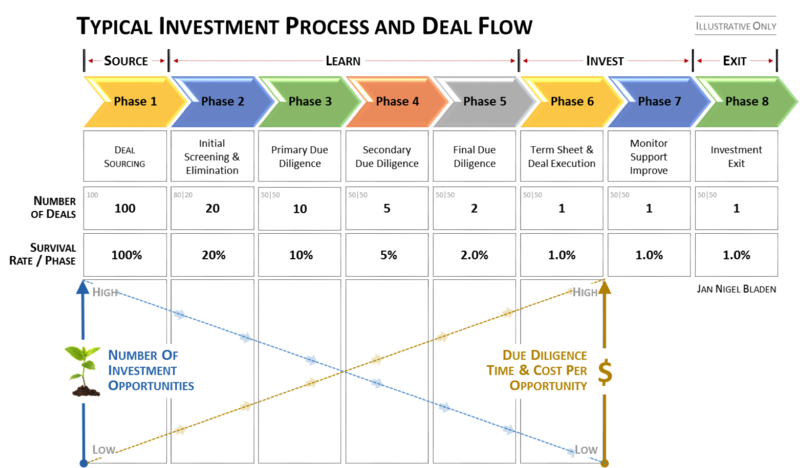 Due diligence typically intensifies in phases, with each phase sifting out unsuccessful investment opportunities and narrowing down on likely investment opportunities. If the deal looks promising and no obvious show stoppers or red flags are identified, then the due diligence team will typically present the opportunity to the investment committee of the investment fund for an initial funding approval (end of Phase 5). Final terms of the deal with be negotiated with lawyers on both sides (Phase 6), and the deal will transact, with funds being released and equity being traded. You’ll need to appreciate several elements to the relationship between your portfolio company and the investor, but be clear about one thing: your investor (General Partner or The Fund Manager) does not want to be the CEO of your company, nor does he want to run the company on a day to day. He will want to take board seats, he will encourage you to reshuffle senior management based on skills and performance, and he will provide active advice, support and introductions in respect of operations, strategy and financial management. He will want to aggressively drive revenue, sales, operational and financial efficiencies, optimizing working capital, push expansion and any other key factors that will contribute towards generating a higher share value in the next three to five years. 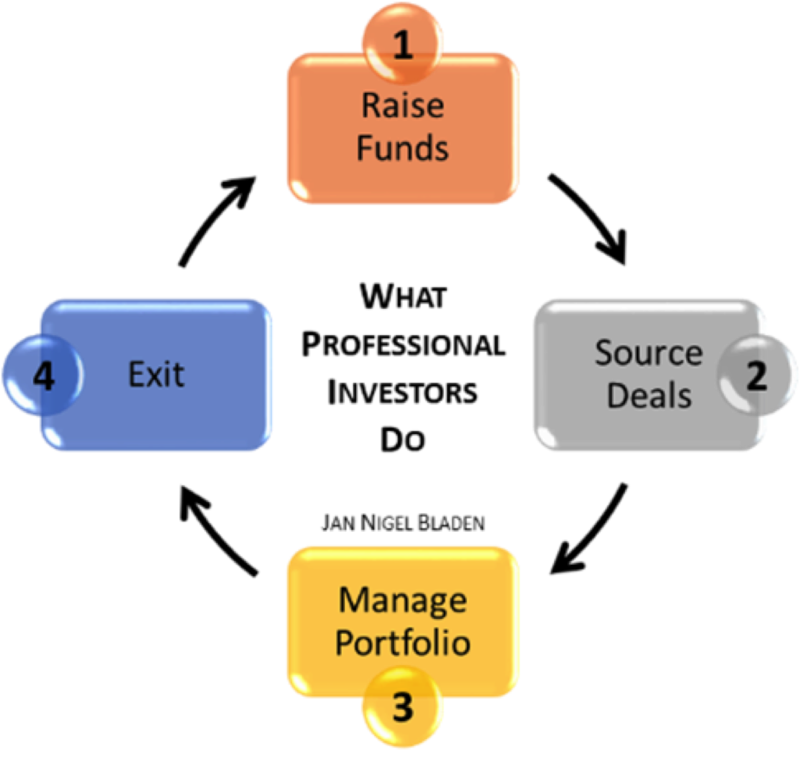 Your investor has purchased shares in your organization with the sole intention of selling them for a substantial profit at a later date, and some larger Private Equity funds have specialized teams whose sole objective is to improve the operational and financial efficiency of the portfolio companies so as to maximize resell value. These teams are commonly good at what they do but can also be quite ruthless. And how involved your investor is really depends on how big their investment is in your portfolio company. If the investor only own a small minority stake, they probably won’t be very involved, leaving the lead investors (the one owning the larger stake) to be most involved. However, if they own either a sizeable percentage of the equity or a significant portion of the entire fund is invested in the company, then they will be much more engaged in improving the company for a profitable exit down the line. Your investor will produce regular reports on the performance of portfolio companies and will share these with his own investors (the pension and retirement funds, endowments, insurance companies, and wealthy individuals who all invested in his Fund from which you got your investment). The end goal for the investor is to exit their portfolio companies at a substantial profit. Typically, the exit occurs between three and seven years after the original investment, but it could be shorter or take longer depending on the strategic circumstances, economic cycles, availability of suitable buyers and other factors. Most exits happen as the result of either a sale or merger of the portfolio company (most likely exit), an initial public offering (only a small fraction go this way), a redemption (redemption rights are almost never exercised) and eventually a management buy-out (normally not possible). While the investor may do a lot of the coordination to sell the firm’s portfolio companies, they may also retain investment banks to handle the execution, especially when the transactions are large or complex. Now that you have a high level overview of what an investor does, we’ll take a look at what your next steps are. The majority of experienced investors tend to overlook business plans and focus in on the entrepreneur or business leader and his story, including any presentation materials, financial forecasts and an executive summary. This is logical since the majority of investors actually invest in, and place their bets on, people and teams rather than business projects or business plans. Therefore, the only goal of your first submission (a Business Executive Summary) to any investor is to obtain a face-to-face meeting. 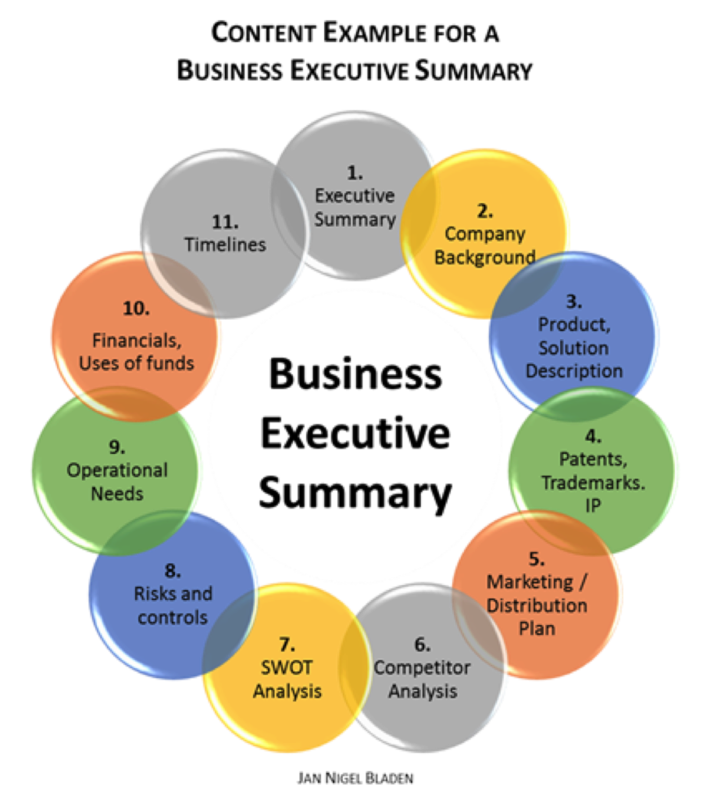 As such, the content and layout of your Business Executive Summary needs to be well thought out and structured so as to optimize your chances of passing the first hurdle (Phase 1 in the Typical Investment Process and Deal Flow diagram) and meeting your potential investor. Keep your initial document as brief as possible and limit it to a maximum of two to four pages. It must be easy to read. Images and charts “speak a thousand words,” so optimize the use of visuals where possible. Resist the temptation to use complex, theoretical, technical or business jargon. Rather, keep it simple and comprehensible using unpretentious language. Remember that any word you have to hunt for in a thesaurus is probably the wrong word. Be blunt, be honest and be transparent (better a diamond with a flaw than a pebble without). Your investor will carry out substantial due diligence prior to providing funds, and so the more upfront you are, the better the chance you have in developing a strong positive relationship, based on trust. It’s remarkably simple; investors review so many deals that they actually become experts at filtering investment and business project proposals, and a simple Business Executive Summary will substantially increase the chances of you obtaining that initial face-to-face meeting. Understand what an investor does and preempt what he wants, save both your time and their time, and utilize the saved time to build a trusted relationship with your potential future investors while obtaining free, experienced advice. At the end of the day, investors invest in people, not projects or business plans. As you start negotiations, keep in the back of your mind that 100% of nothing or a small organization is a lot less than 20% of a big company. The investor will want his slice of the pie and will expect some sort of control. Be a realist: no investor will provide the majority of your capital in return for no control and a minority shareholding. Once you’ve done all this and the odds are stacked in your favor, accept that you may still not succeed with the first investor you talk to for multiple reasons beyond your control, including chemistry, personality, geography, industry, size, and others. There may simply be a mismatch between your business venture and the approached investor. And then the investor may also make the ultimate blunder and mistake a rough diamond for a worthless pebble. However, now is your chance to learn from every professional investor you talk to for free, and make use of their investment knowledge and experience. Ask the questions: what went wrong? What could you do better? What are the typical risks and pitfalls that you need to avoid? Recall that the assessment is also two ways. Can you trust this investor? When all is said and done, an investor wants a viable investment with the highest chances of success (and so should you), and you need their investment. Remember that a diamond is just a piece of charcoal that handled stress exceptionally well. Be a rough diamond and cash that investor’s check. a. A description of the problems or challenges, and how your solutions or products resolve the issue. b. A description of the market for your product or solution, including distribution and sales. c. A description of how your venture provides the solutions or products. d. A description of how you will make a return on investment for shareholders, yourself included. e. The Management Team and their relevant experience. f. List any patents and/or trademarks and any intellectual property linked to the product or solution. g. Highlight the competition and competitors- why you are better? h. Highlight any areas of risk and how else you may seek non-financial support from your investors. i. What size of funding are you seeking and what will you do with these funds? j. What other sources of funds have you already secured? k. If a valuation has already been calculated, how was it calculated, and what is the valuation. l. Include your projected financials including revenue, cost of goods sold, operating expenses and anticipated earnings before interest, taxes, depreciation, and amortization.